In this podcast, Manny Coats shares his change of mindset in terms of what products to go after. How do I benefit from selling oversize products? 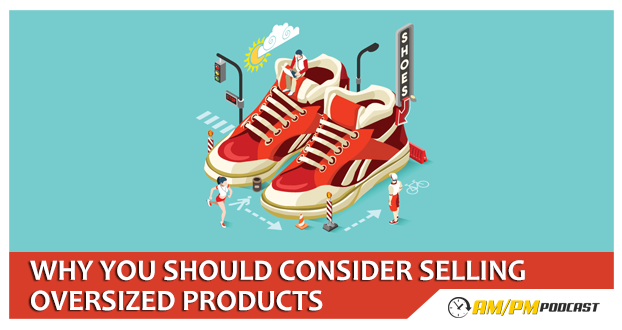 What are the advantages and disadvantages of selling oversize products? I want to talk about a little change in my mindset about what products you guys should go after. I started this journey in December 2015. I learned everything I could from podcasts speaking to people, websites… the main theme that everyone was following was that you should order small products in the size of a shoe box. It’s a good descriptor of a size and to also keep the weight to 1 or 2 pounds, not to keep it too heavy to ship from China to Amazon or for Amazons FBA fees that increases as the weight of your product increases. Everybody is learning from the same stuff – now I think that the best thing to do is to find oversized products because if 99% of the people that are learning this are going for small products that weigh less than a pound then that is where all the competition is. Moving forward, I will be looking at oversized products because if all your competitors are jumping into small products, all these large products aren’t that competitive, relative to the small products. Couple of drawbacks – Amazon gives you a lot more warehouse space for standard size products. When you go to oversize, the number drops drastically. If you can find an oversized product that you can buy for $15 and you can sell it for $90, the margins that you make will make up for the extra costs for the Amazon storage fees, the storage fees, all of that. If you ship by boat, it’s not going to be that high. Don’t shy away from small or light products – if you find a winner, go after that. But go to oversized products you can sell for nearly $100.